No more mosquitos! An electric pump begins humming. Immediately a fine mist of water-based insecticides appears out of the nozzles located in the ceiling of the barn. The "Shoo-Fly" Story…"Horsemen Serving Horsemen Since 1979!" Shoo-fly's founder, Charles F. "Chuck" Hudson Jr, has been intimately involved in the insect control business for over 25 years. Prior to 1979, Chuck made his living as a crop-duster pilot, and became aware of the properties and effectiveness of many different insecticides. He and his wife, Carol Dicken Hudson, have also been involved in breeding, raising, training and showing fine Morgan horses for many years. Their farm, Trebles Morgan Manor, has been home to some notable champions, including their foundation sire, Treble, Tug Hill Commando and Treble's Willy Wild. As experienced "horse people" themselves, Chuck and Carol wanted a safe and effective fly control system. Chuck decided to design the finest system available on the market. He selected only the finest parts for his systems: all brass and stainless steel nozzles, high PSI nylon tubing, a 24-hour programmable timer, and the U.S.D.A. approved, biodegradable insecticides to be dispensed through the system. Chuck makes a point of examining and selecting the most reliable and well-made components for Shoo-fly. He is proud to say he would not change one single component. He believes there are none better. Many of his systems have been in operation for 20 years and are still going strong. How Does The Shoo-fly Control System Work In My Barn? An electric pump begins humming. Immediately a fine mist of water-based insecticides appears out of the nozzles located above. The light air currents slowly swirl the mist around and flies, mosquitos, hornets, wasps and no-see-ums begin dropping out of the air, dead. After a minute the pump shuts off and the mist vanishes. For over 35 years, Shoo-fly Automatic Insect Control Systems have been helping keep barns, patios and commercial facilities free of flies and other flying insects, safely and conveniently. The insecticides and Automatic Insect Control System in the above scenario are the result of feedback from the experienced horsemen and businessmen who require a safe, economical and effective insect control system. Is My Shoo-fly Programmable To Suit The Individual Needs Of My Barn? YES! The Automatic Insect Control system is programmable in operation of desired cycle time and hour of the day (24-hour). This system eliminates waste to save insecticide costs and is extremely convenient. Are Shoo-fly Insect Control Systems Easy To Install? Absolutely! Shoo-fly Automatic Insect Control Systems are manufactured in Ocala, Florida and are custom designed for your facility. They are easily installed, taking an average of 20-30 minutes per nozzle for installation. We maintain a complete inventory of all Shoo-fly system parts and insecticides and have immediate shipments ready to ship anywhere in the United States and most parts of the world. What If I Already Have A Spray System, But Want To Use Shoo-Fly Sprays? No problem-- and you will enjoy your current system more with Shoo-fly Spray because it is so highly effective and cost efficient! Because Shoo-fly products are compatible with all other overhead misting systems, you can use our safe and effective water emulsifiable insecticides with any competitor’s system. Most of our customers maintain their own system and enjoy the savings and the lowest prices available anywhere. For those who don’t have the time or desire, there are Shoo-fly distributors throughout the U.S. that are happy to help. 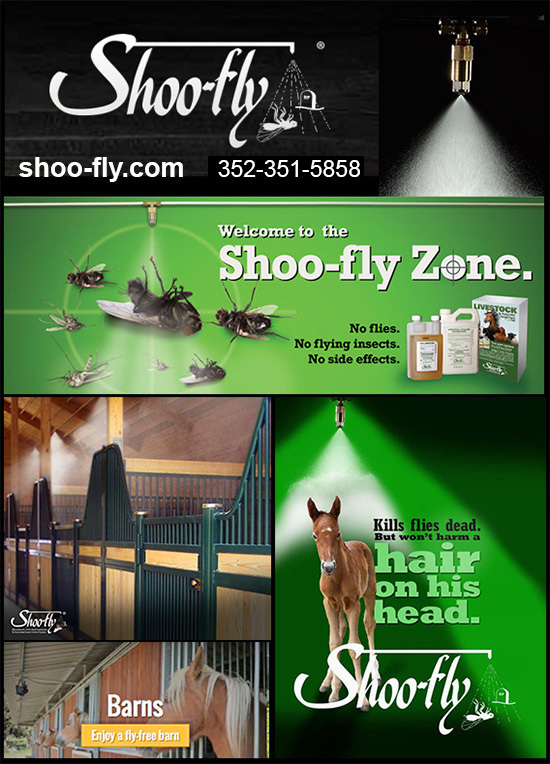 So Is Shoo-fly Really The Industry Standard For Fly Control Systems? Shoo-fly is proud to say we would not change one single component. There are none better. Many of Shoo-fly’s systems have been in operation for over 20 years and are still going strong. What Products Does Shoo-fly Offer? Just pick up the phone and give us a call. Don't suffer with flying insects that make life unpleasant for you and miserable for your horses. You can even Fax a sketch of your facility – (Fax: 352-351-3848) - we will custom design an automatic insect control system to fit your needs, with easy to follow instructions. The helpful professionals at Shoo-fly welcome your calls and they will help you get the system that is right for your barn!